You can plug normal joystick in joysticks port on Twilighte card. There is two joysticks ports. It can handle only one button. You can also add a TOM2 device in order to plug a USB joypad or a USB mouse. You can found tom2 on ebay. There is no games working on it. But it works like telestrat one. Stormlord game says that you can start “tele joysticks” but the code does not work. Pulsoids manages also joysticks, but it needs sedoric to work. For example, you can start atmos rom, all features on Twilighte card will be available. It means that you can code tape file, and use joysticks. 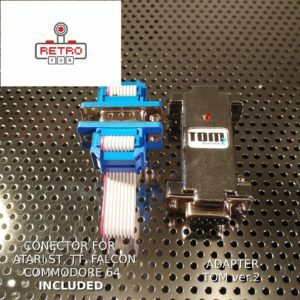 It will work also in telestrat because joysticks parts works like telestrat’s one. You can plug a wireless usb joypad with TOM2 hardware. For example, logitech gamepad F710 works. But every joypad with “HID” protocol will works. Usb wireless Mouse also works but there is no driver and no software with that. This entry was posted in feature, Hardware, news. Bookmark the permalink.